HOW DO YOU GET a wild harpist, an 80-piece orchestra, a mad scientist’s laboratory and a garbage truck into your living room? With “Invention & Alchemy” a DVD/CD project filled with music and stories- all backed by the 80-piece Grand Rapids Symphony and celebrated conductor David Lockington. WAY MORE THAN A CONCERT, “Invention & Alchemy” is like a one-woman show with a cast of 80. On the DVD, the feature presentation, including stories and music, lasts about 97 minutes. The special features include an 18-minute Behind-the-Scenes film, “Healing the Waters” — an intimate vignette with members of the Grand Rapids Ballet, and 12 interactive “White Rabbit” clips (short features that can be accessed from the main program or from the Special Features Menu). …LIKE A RADIO SHOW: Producer Jonathan Wyner wanted to created a companion CD that played “like a radio show” – a cross between a live concert experience and “books on tape” – the perfect CD for long drives! EVERY PIECE is composed, arranged, orchestrated and performed by Deborah Henson-Conant, with her mix of humor, beauty, intimacy and bombast. “Invention & Alchemy” was created first and foremost as a DVD. It was filmed in hi-definition with multiple cameras during three days of live performances. 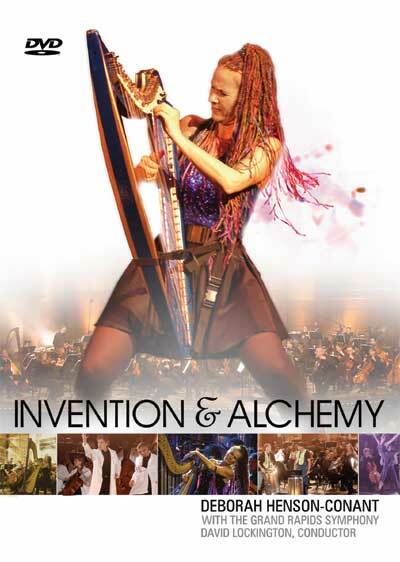 With an Emmy-winning director, Grammy-winning sound engineers, an irrepressible star, a celebrated and multi-talented conductor, award-winning composer, an exuberant and masterful orchestra, “Invention & Alchemy” breaks the barrier between music video, PBS-type broadcast and narrative film. The 13 titles fit together like a collection of short stories, with the Henson-Conant as narrator, tour guide and musical inventor. The CD is a companion disc. Created to play like a radio play, the CD allows you to bring the DVD experience with you wherever you go and includes most, but not all, of the scenes from the DVD. Unlike a standard music album, it’s not just a collection of musical numbers, but a series of stories told in words and music. 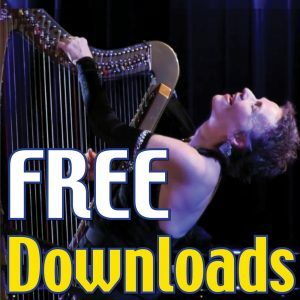 Ever since she put a classical instrument on the map in the jazz field with her unique, custom-built, strap-on electric harp, Henson-Conant has been forging a path for musicians striving to not merely represent their instrument, but finding a way to make their instrument represent themselves – who they are. She has managed to chip away the connotations that the harp is simply a classical instrument and she is simply a classical musician and reach some little, tiny thing inside that is “her,” and she has found a way to build that back up to the tour-de-force talent she is today. Now she and her craft can be something other than what they’ve always been. Something magical. A new idea. Something like nothing you’ve ever seen before. 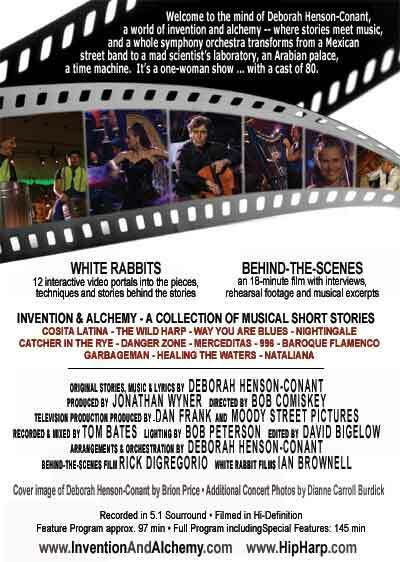 All of these notions of innovation, creativity and rebirth are alive in her DVD, Invention & Alchemy – a revolutionary endeavor that takes the beauty of classical music, warps it with daring nuances of the blues, flamenco and even a Mexican street band and then enlivens it with storytelling and an exuberant theatricality. Nowhere else will you see an entire orchestra in stark white lab coats or a stage transform into a set piece from 1001 Arabian Nights and a renowned conductor become a vengeful Sultan. The DVD gives a whole new meaning to crossover classical. Deborah Henson-Conant is the writer of the stories, the music, the lyrics and the orchestrations. It all truly comes from one woman’s mind. With the seed of a musical idea, Henson-Conant collaborated with the Grand Rapids Symphony to bring it bursting to life. Each piece garners its power from the integration – the alchemy – of the orchestra and the solo performer. With the help of a brilliant conductor, an Emmy-winning director and a Grammy-winning sound engineer and producer, each aspect of the DVD – the orchestra, lighting, direction, camera work – becomes the living, breathing body of a single, irrepressible soul. Yes, Invention & Alchemy may only be a DVD, but it stands for every person with an idea; every person who wants to tell a story. Deborah Henson-Conant has a story to tell. The Grand Rapids Symphony becomes her world – the emblem of the world that lets each person become who they want to be; who they’re meant to be. The you inside of us all. Shara Dunn: Shara came onto the project as a Project Manager in Boston and stayed on as Deborah’s right-hand-man through final production of the DVD. She’s currently in graduate school in Amherst, MA. The DVD version of the project includes a 97-minute feature presentation and nearly 50 minutes of bonus special features. The Grammy-Nominated CD version is an audio-only version of the DVD, and, with both music and stories, was created to be listened to as audio music theatre – a cross between a soundtrack album and a radio play. DID DEBORAH GO TO THE GRAMMYS? DID THEY WIN? WHAT HAPPENED? Deborah and her staff, friends and family went to the Grammys, had a FABULOUS time and didn’t win the golden Gramophone — this time! 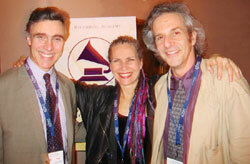 You can read their Grammy Diaries and see some pictures here. DID THE DVD & CD BOTH WIN THE NOMINATION? GRAMMY Awards are for audio recordings, not for film or video. So, officially, the CD won the nomination – though it’s the same music that’s on the DVD. HOW MANY GRAMMY CATEGORIES ARE THERE? There are 108 categories within 30 genres of music such as pop, gospel, rap and classical. “Invention & Alchemy” was nominated in the “Best Classical Crossover Album” category. “Invention & Alchemy” is also considered “Classical Crossover” simply because it uses an ensemble that’s generally considered a classical ensemble (the symphony orchestra), to play “non-classical” music. From what we can tell, “Classical Crossover” is any music that crosses over the divide between what’s traditionally considered classical music and music that is more influenced by current popular culture. WHY IS “INVENTION & ALCHEMY” CONSIDERED A “CLASSICAL CROSSOVER” ALBUM? In the case of “Invention & Alchemy,” the music itself is a crossover that mixes underlying structures of classical, jazz, folk, flamenco and other genres. For example, “Baroque Flamenco” (the first cut on the CD) starts with a classical minuet and a classical structure called a “Rondo,” but that melody is alternated with sections built on a fast latin rhythm called “Naningo” (a rhythm most familiar from Leonard Bernstein’s “America”) and the whole piece culminates in a “cadenza” (a free improvisatory-type section) – on the harp – in a Flamenco style. So there’s a LOT of crossover in Baroque Flamenco. This stylistic crossover is inspired in part by Deborah’s musical imagination and her background in both classical and jazz-based styles, but also by the story inside the piece: the story of a troupe of Flamenco dancers who discover that their new guitar is really a time-machine — and who end up crashing a Minuet party thrown by Marie Antoinette. “The Danger Zone” is a similar hybrid of classical and non-classical ideas. The melody is angular and offbeat, but follows the structure of a very short sonata — except that the section classical folks call the “development” is based on a sort of rhythm-and-blues groove. Like a classical concerto, the solo instrument stops the action near the end of the piece and plays a “cadenza” (a more free exploration of the instrument and the themes of the piece) — but … uh … it’s definitely not classical. In “Way You Are Blues,” the crossover is simpler: an orchestra is playing blues. But this crossover becomes enhanced when, for example, the principle bass player takes a jazz-type solo, but using a classical bowing technique — or when the solo harp starts playing with guitar-like distortion. This mix of classical and non-classical concepts runs throughout the music of “Invention & Alchemy” and makes it a Classical Crossover album both in concept and in sound. WHOSE GRAMMY NOMINATION IS IT? DEBORAH’S? THE GRAND RAPIDS SYMPHONY’S? THE PRODUCER’S? As we understand it, especially in the case of “Album,” Grammy Nominations for “Best Classical Crossover Album” (versus nominations like “Best Song”) belong to everyone who took part in creating that album. That means that now Deborah is a “Grammy Nominated Artist” and David Lockington is a “Grammy Nominated Conductor,” and so on. We are particularly proud of this nomination for that very reason. This was a deeply collaborative project and the fact that it received an album-wide nomination reflects to us the spirit in which this project was invented and developed. We’re deeply proud of this nomination and everything it stands for. GOT MORE QUESTIONS? Send them to publicity@HipHarp.com and we’ll try to answer them!